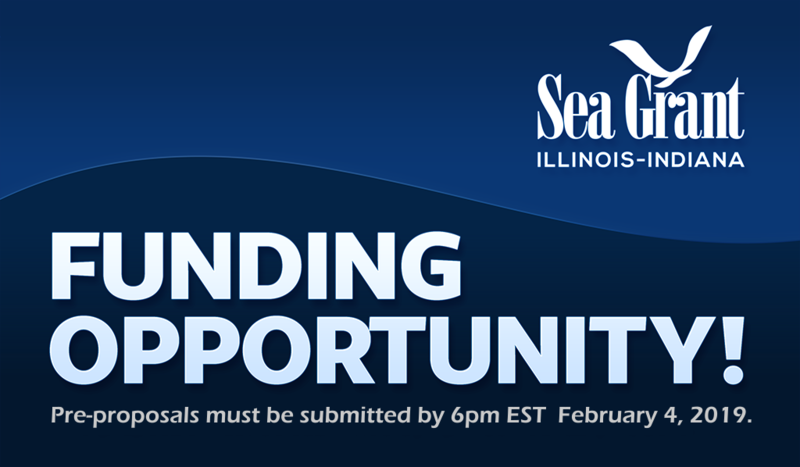 The Illinois-Indiana Sea Grant College Program (IISG) has up to $600,000 to invest in promising research projects relevant to southern Lake Michigan and surrounding coastal communities in northeast Illinois and northwest Indiana. Work is to be completed in the 2020-2021 biennium. As part of the Sea Grant National Aquaculture Initiative, IISG expects to have additional funds available to support aquaculture research. Thus, we strongly encourage proposals to inform aquaculture in Illinois and Indiana. IISG anticipates funding projects that use a variety of experimental techniques, including, but not limited to, field or laboratory studies, social science assessments (e.g., of attitudes or perceptions related to behavior change), economic cost-benefit analyses, and modeling efforts. IISG-funded research serves as a strong basis for outreach or extension programs; thus, applicants are strongly encouraged to identify clear end users or otherwise make solid connections to stakeholder groups who will benefit from their research. Project investigators from educational or research institutions in Illinois or Indiana, including universities, museums, and other NGOs, are eligible for these funds. Projects can request up to $90,000 per year for two years (maximum $180,000 total). All applicants must demonstrate at least 50% match (one non-federal dollar for every two federal dollars requested). Funding is available for up to two years beginning February 1, 2020, or the date of the award. All projects should be completed by January 31, 2022. Prospective PIs must submit a preproposal to be considered for funding. Preproposals are due by 5 p.m. CST (6 p.m. EST) February 4, 2019 to iisgres@purdue.edu. Please indicate “2020 Large Grant Preproposal” in the subject line. The full RFP, which includes additional guidance, can be found here: http://iiseagrant.org/wp-content/uploads/2018/11/IISG_LargeProj_RFP_2018.pdf. Questions can be sent to IISG Research Coordinator Carolyn Foley (cfoley@purdue.edu).